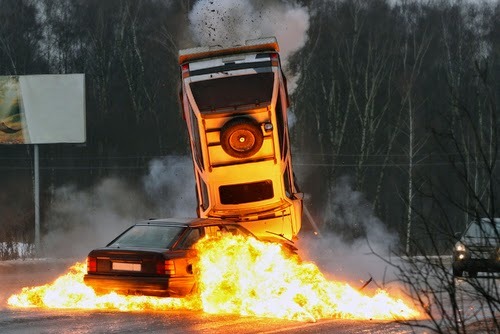 Stunt car drivers need years of training and experience. Their lives depend on it. They have to know the mechanics of their vehicles, have excellent hand-eye coordination, know how much movement is needed, and be able to focus on precision driving. They can do amazing things like flip a car, perform a cannon roll, do a pipe ramp stunt, and create realistic and hair raising car chases. Ever wonder how they do it? To make a car roll over while driving and appear as if the driver has lost control actually takes a lot of control. Before the Cannon Roll was introduced, stunt drivers used tilted ramps to toss the vehicle off the surface and make it roll over. Now the more common method is to push or jump the car with a cannon mounted somewhere under the vehicle, timed to explode and roll the vehicle to look like extreme loss of control. The cannon roll was invented by pioneering stuntman Hal Needham for the film “McQ” starring John Wayne. He built a 16-inch diameter cannon with walls almost two inches thick and stuffed it with gun powder. The stunt worked, but Needham was badly injured in the stunt, including a broken back, punctured lung, broken ribs, and missing teeth. One of the greatest car stunts ever, the Astro Spiral Jump, was filmed in the 1974 James Bond movie “The Man with the Golden Gun,” with Roger Moore as James Bond. The difficult stunt involved jumping a car off one ramp into a 360-degree barrel roll across a river, then landing it on another ramp to drive off without any damage. There was no computer generated imagery. The stunt was developed at Calspan Corporation at Cornell University by Raymond McHenry using a computer simulation. He calculated how to twist the ramps, how to center the weight in the vehicle, and what speed the car would need to be driven during trials before actually performing the stunt at a show in the Houston Astrodome in 1972, before it was done in the film. It has not been filmed since. When you see those cars in the air in movies, after coming to a construction site where the road is out or perhaps an earthquake that splits the earth’s surface, it may look like the driver is just going for it at high speed. But the reality is that it’s done with ramps. In film, ramps can be hidden or disguised so the high speed jumps seem to be happening on a city street. The vehicles are modified as well, including centering the weight of the vehicle and tightening the shock casing oil valve to slow the rebound of springs on impact and modifying the hood for better aerodynamics. Stunt drivers need to outfit vehicles with things like quality tires from retailers like TireBuyer to be better able to complete stunts safely and legally. While legendary stuntmen like Hal Needham gained most of their expertise on the job and by doing things that others wouldn’t, today’s training for stunt work takes place before stuntmen ever get in front of a camera. In the U.K., the British Action Academy trains risk-takers and the British Equity Stunt Register certifies them, usually after time as film extras. In the U.S., apprenticing with experienced stunt people, joining the Screen Actors Guild and working as an extra on movie sets are the normal routes, although there are places like the Stunt Academy that will train people on the basics and specifics of stunt work, according to HowStuffWorks.